What is your TURN-AROUND time on print products? Most of our orders are completed within just 1-10 days after approval of the artwork, depending on the type of order. Promotional items sometimes take several weeks so please make sure you plan well ahead for events. What if I’ve requested a QUOTE but haven’t heard back yet? We apologize for making you wait. Be assured that we do appreciate your business. At times it might take a few days for us to reply with a quote. If you are under a tight deadline and need to hear back from us sooner, please give us a call at 770-487-7376 and let us know. We are open Monday - Friday from 8 am - 5 pm. How much do screen printed shirts cost? Pricing is determined by the product/apparel you choose, the quantity (12 minimum), colors used, screens, artwork, and of course tax. If you would like to get a quote on your next project, please call or email us and we'd be happy to help you. What do you charge for ARTWORK and SETUP? Our hourly rate for artwork/setup is $30 an hour. What kind of ARTWORK can I submit to be printed? In order for your artwork to be accepted as complete, it should be received in a print ready format. These are usually .pdf, .eps, .ai. files. If you send a .psd, .tif, or .jpg file, art should be submitted at 300+ dpi & at final print size. Microsoft Word files should be saved to .pdf format if possible. Submit artwork with .25” bleed and crop marks. Bleed is the continuation of the artwork beyond the trim for border-less printing. For Vector based artwork (created in Illustrator, Coreldraw, etc.) convert all text to outlines/curves or include font files with artwork. Images from the Internet or web sites are generally 72 dpi. These files usually do not provide a good quality image for printing. Color and resolution are removed from these images to allow for rapid transfer on the Internet. These images would appear fuzzy and dull if printed. But let us see what you’ve found, we might have an idea how to make it work. I have a NEW BUSINESS - what can you do for me? Our art department can create a complete professional image for you. This includes a LOGO and the items you will need to start off with such as business cards, invoices, ads, brochures and much more. We are known for working within our customers’ budgets, finding the best solutions that will help your business to grow rapidly. 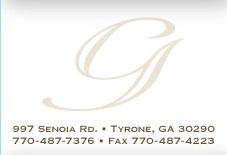 We are located in Tyrone, GA, but have customers throughout the United States. Our shop is conveniently reached by customers from cities such as Peachtree City (30269), Fayetteville (30214), Newnan (30263), Fairburn (30213), Senoia (30276), Jonesboro (30236), Riverdale (30274), Union City (30291), and College Park (30337). We offer pick-up and delivery services in Fayette County and various areas of Metro Atlanta. We accept cash, checks, and various credit cards.